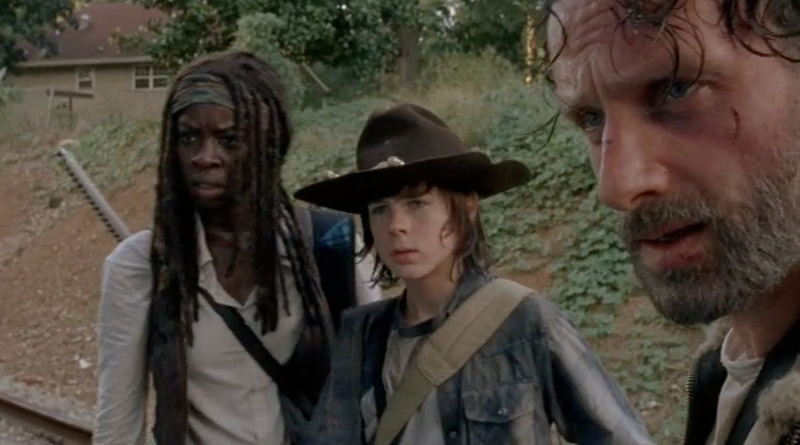 Rick, Michonne and Carl have made a tiny camp as they venture closer to Terminus. 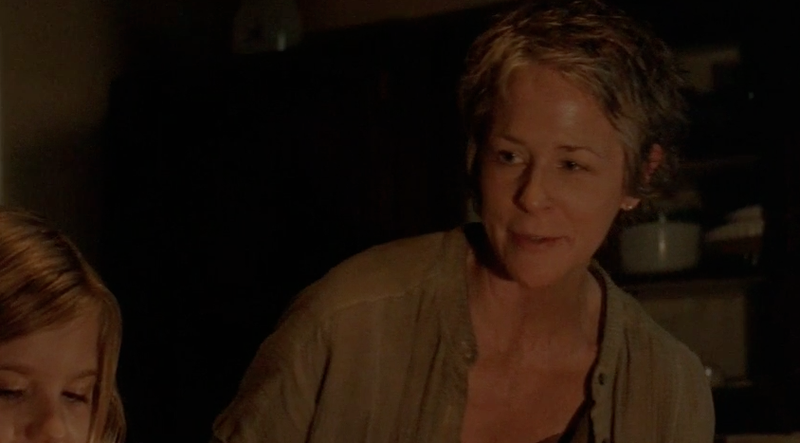 They risk a fire as they talk about Terminus and how they will approach the sanctuary. Their brief moment of peace is interrupted by a gang of thugs, led by a cruel man named Joe. 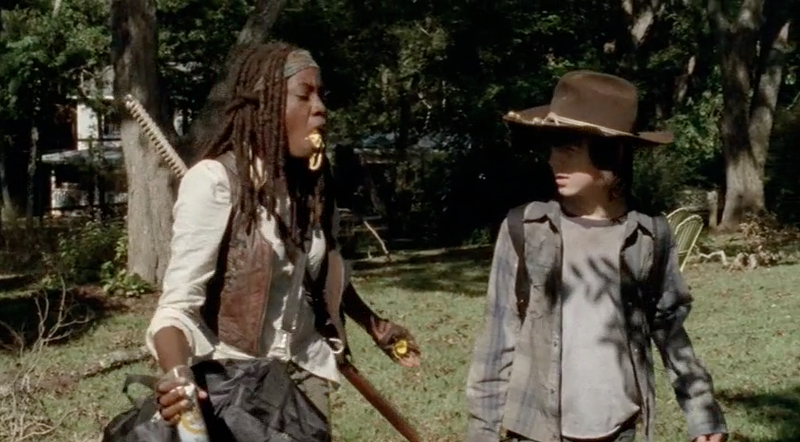 They hold Rick and Michonne at gunpoint. 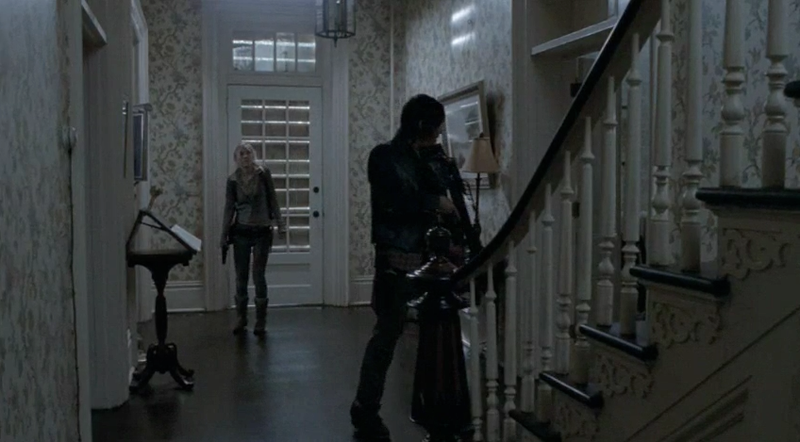 It is the very same, violent group that invaded the house where Rick, Michonne and Carl took shelter. 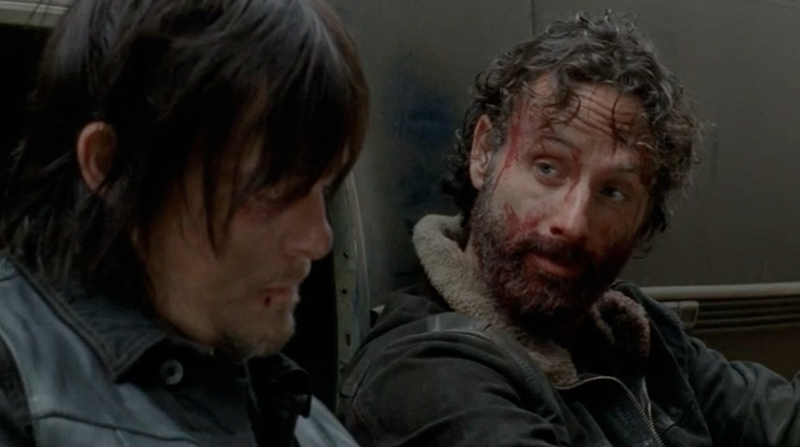 They blame Rick for the death of one of their group and plan to take revenge. Impossibly, Daryl Dixon is with this group of sociopaths. 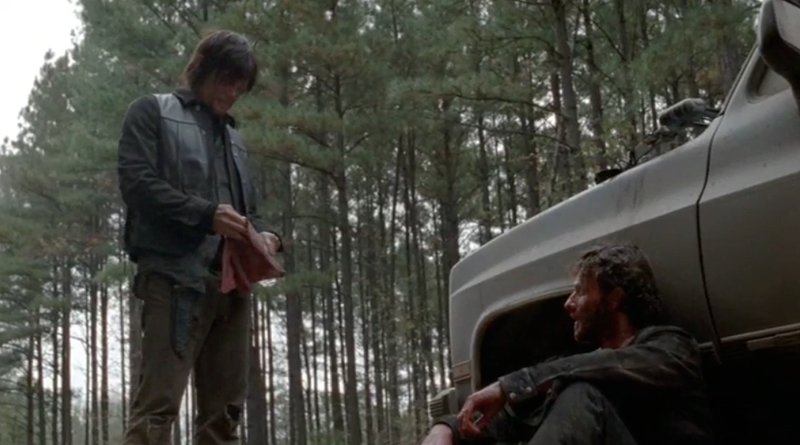 Daryl immediately intervenes on Rick's behalf and offers himself up in trade. Joe soundly rejects the offer and the men turn on Daryl. Threatened with unimaginable horrors, Rick reacts with a blinding rage. 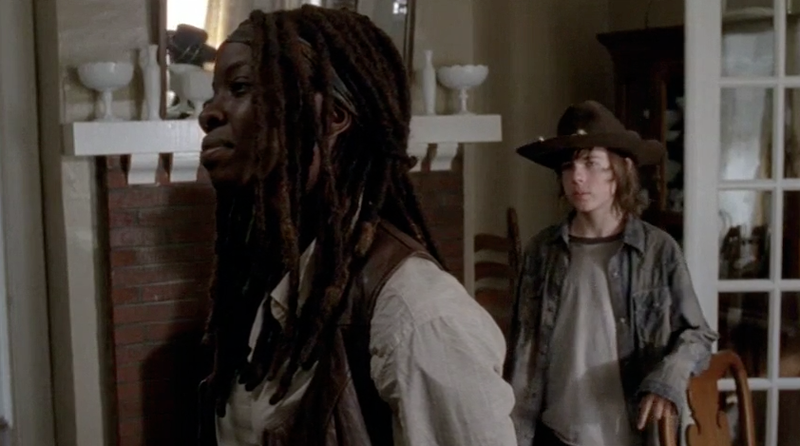 The remaining marauders are quickly dispatched by Michonne and Daryl. 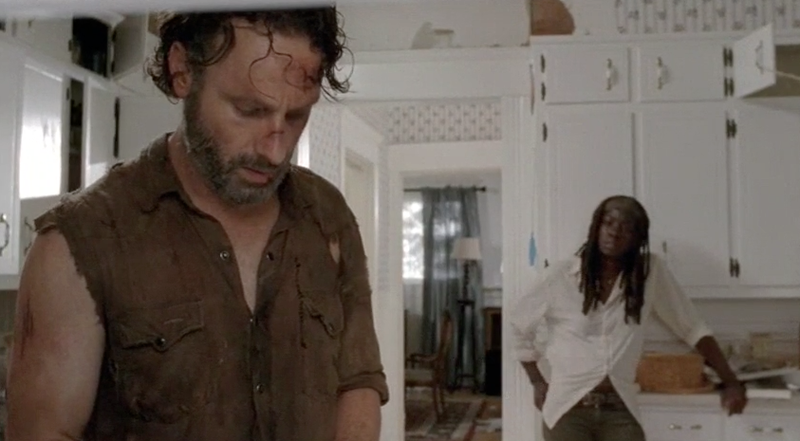 Although they have faced death and won, Rick and company are still in grave danger. Living on the open road is a risky venture; and not a path to be chosen lightly. 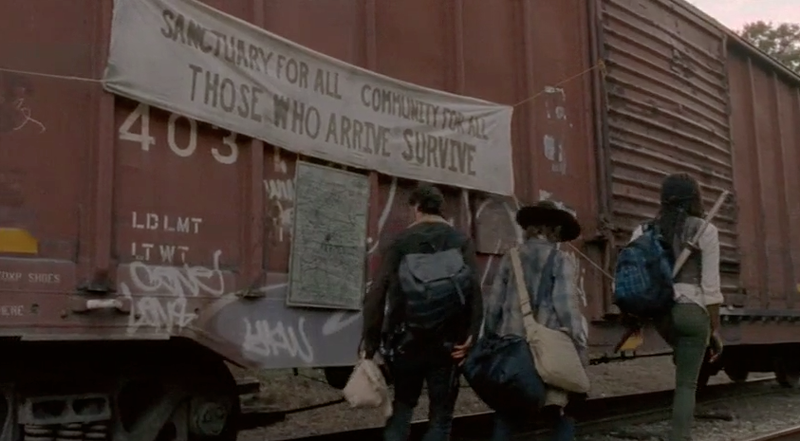 They must continue on to Terminus if they have any hope of long-term survival. They had been near starvation after the loss of the prison, but that night they had the combined supplies of their own…as well as the stash of their attackers. 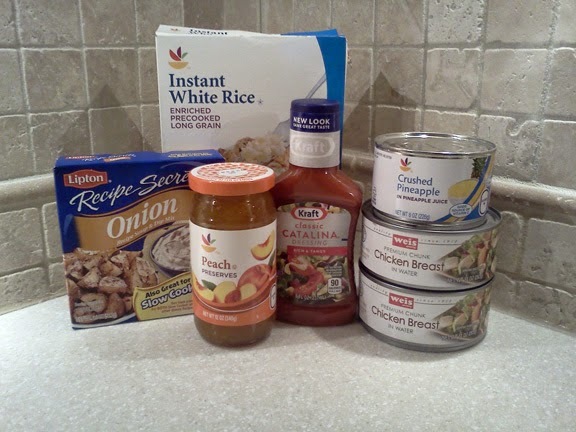 Canned goods can be combined to form the most surprisingly delicious meals. A few cans of vegetables, milk, spices and Michonne's leftover "crazy cheese" can transform into a rich and nutritious chowder. "Claimed" Chowder with its smoky, cheesy broth will transform humble canned vegetables into a soup worthy of being served in any New England Seafood House. And when the dead rise; don't screw with the wrong people. 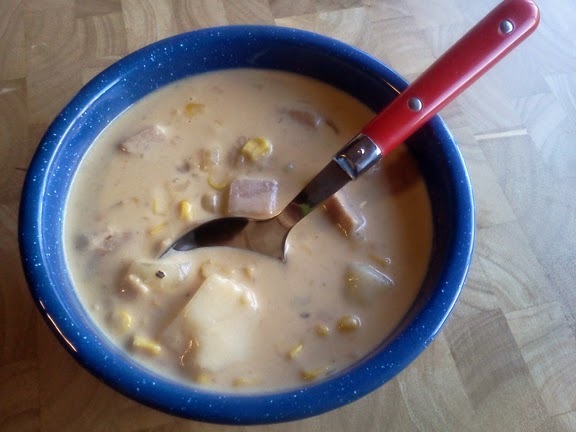 In a large Dutch oven (over medium-high heat or medium-hot campfire coals) combine SPAM, corn, evaporated milk, potatoes and cheese. Heat and stir frequently until blended. Add additional spices and seasonings if you have them. Allow to simmer, stirring constantly until smooth and hot. Check the consistency and add the reserved potato liquid to thin if needed. Serve immediately. 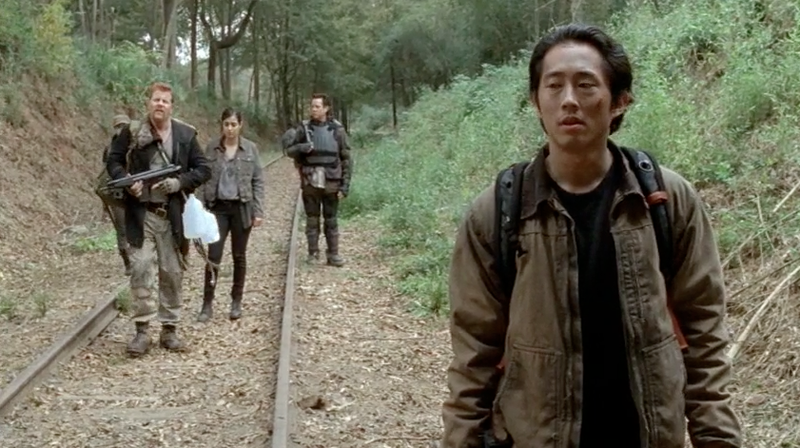 Glenn and Tara continue their journey alongside Abraham and his group. Eugene's eccentric discussions with Tara seem to both irritate and amuse her. The group travels doggedly along the train tracks as Eugene drones on about Zombie Dinosaurs and video games. They are all doing their best to ignore his chattering when they come upon an almost impossible sight. A message has been scrawled in Walker blood on a wooden signpost. 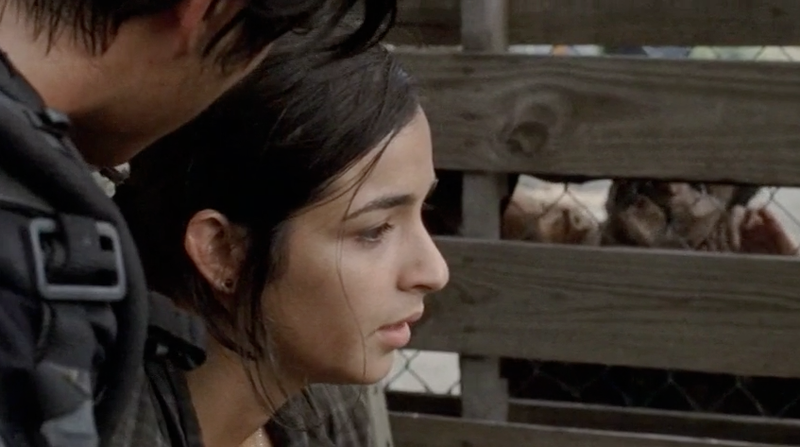 Tara stares in shock as she reads "Glenn Go to Terminus, Maggie, Sasha, Bob." Glenn's face erupts into a thrilled smile as he races onward at top speed to find his wife. 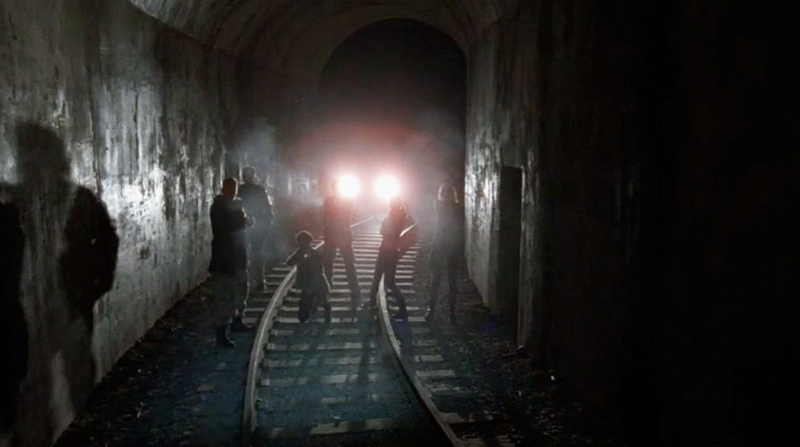 While Abraham initially refuses to allow his group to follow Glenn and Tara into a train tunnel; he does leave them with food, a flashlight and instructions on how to find them again if needed. 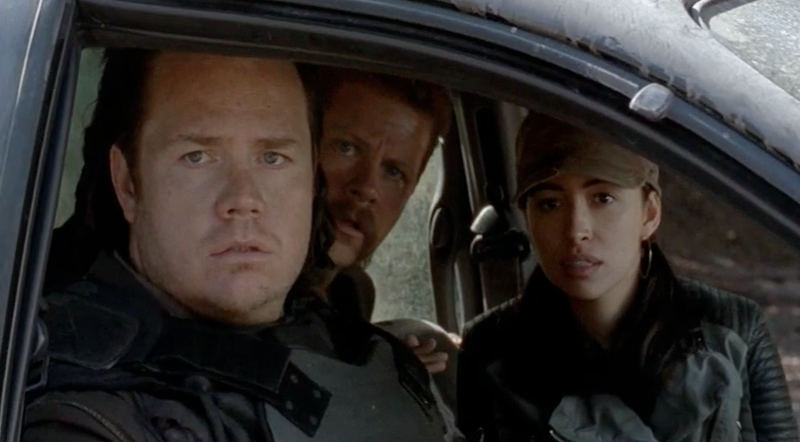 Eugene however, has other plans and tricks Rosita into driving around to the other side of the tunnel as Abraham sleeps in the back seat of their commandeered van. 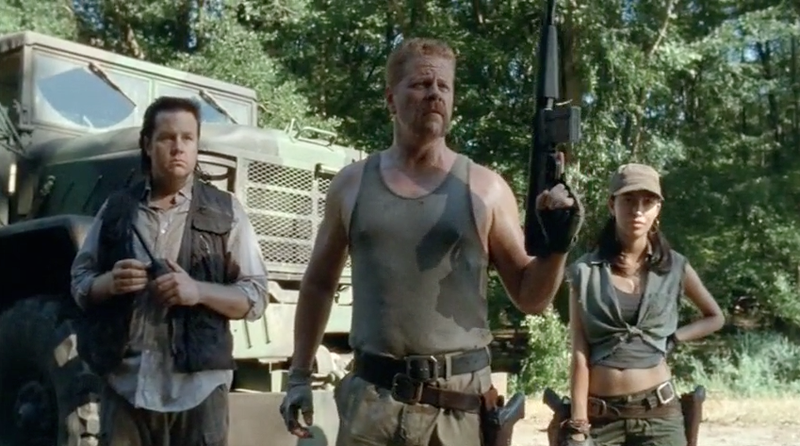 Abraham's rage and Eugene's deception is short-lived when they realize that Glenn and Tara are in trouble. 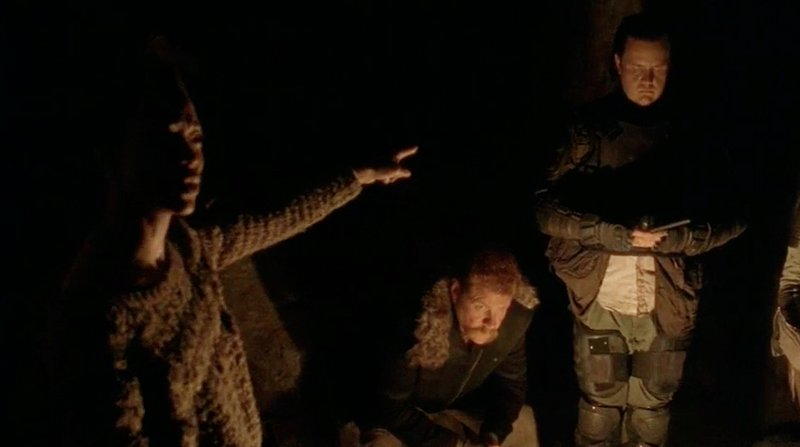 The trio enter the tunnel and encounter Sasha, Maggie and Bob. 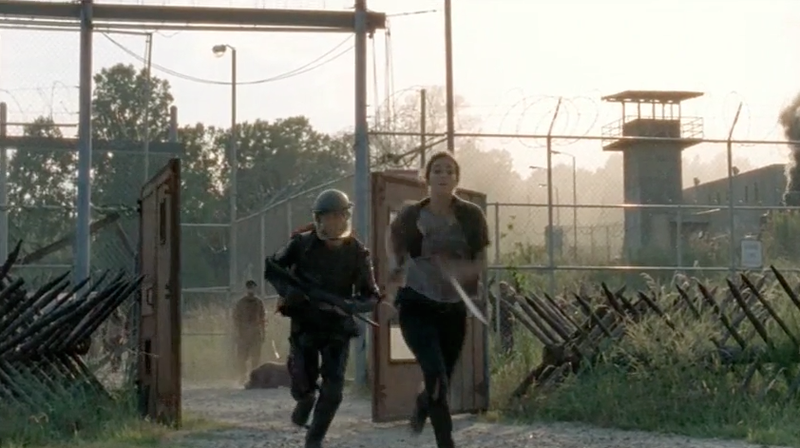 The six of them battle their way through the Walkers to save Glenn and Tara. 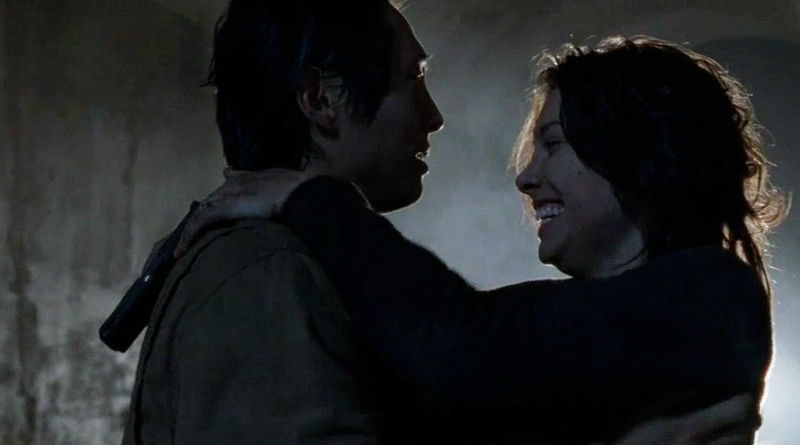 And when the smoke finally clears, Glenn is overjoyed when Maggie runs into his arms. The entire group is delighted to see the reunion. 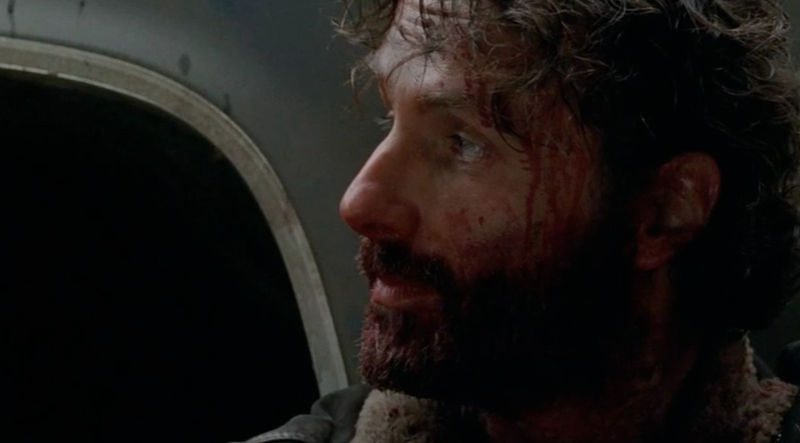 Eugene convinces Abraham to continue on to Terminus in hopes of finding a better vehicle and reinforcements to take on the road to Washington D.C.
That night, the exhausted little band stayed in the safety of the train tunnel. 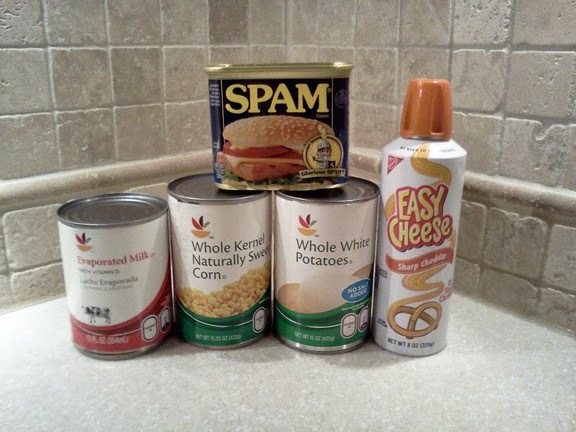 With their combined supplies, they had enough to make a more elaborate meal in celebration of their impossible reunion. 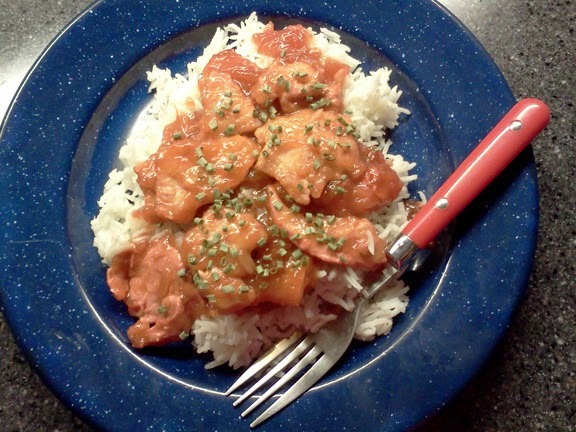 With only six ingredients, this recipe for Hawaiian Chicken, adapted for the Zombie Apocalypse (the original one donated to us by @WalkerBaitProd) is tangy, sweet, sour, hearty, and altogether unique. 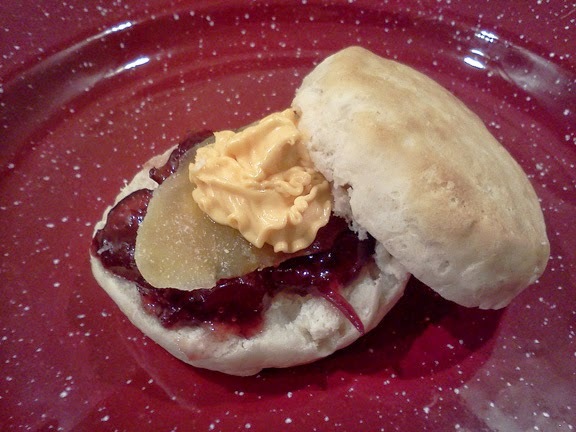 Serve it when you want to celebrate an impossible success with a frugal touch. And when the dead rise; remember that after you save the world…you still have to live with yourself. In a heavy saucepan or Dutch oven, bring 3 cups of water to boil over high heat or hot campfire coals. Cook rice according to package directions for 3 cups of water. In another heavy saucepan or medium Dutch oven, combine Onion Soup Mix, Preserves, Catalina Dressing, Pineapple and drained Chicken meat. Stir well and allow to come to a simmer over medium heat or medium-hot campfire coals. Stir often and allow to simmer for 30 minutes. Serve over rice. 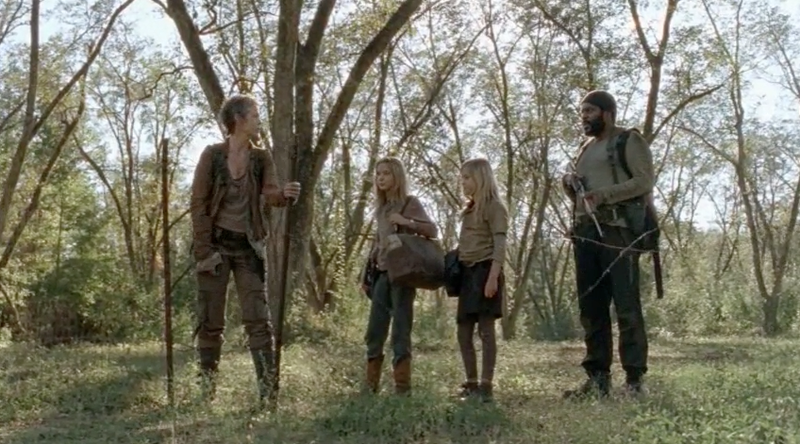 Carol and Tyreese, along with Lizzie, Mika and Judith, have maintained a slower but steady pace after being reunited on the train tracks. While searching for water, Carol and Mika find a small cottage in a pecan grove. Delighted with their discovery, the little group decides to stay for a few nights and catch their breath. They find a well with water and enough pecan and peach trees for them to eat their fill. That night, Mika is thrilled when she locates a doll left behind by the former owner's children. Tyreese is unsure how to relax after being on guard for so long while Carol and Lizzie shell mounds of pecans. 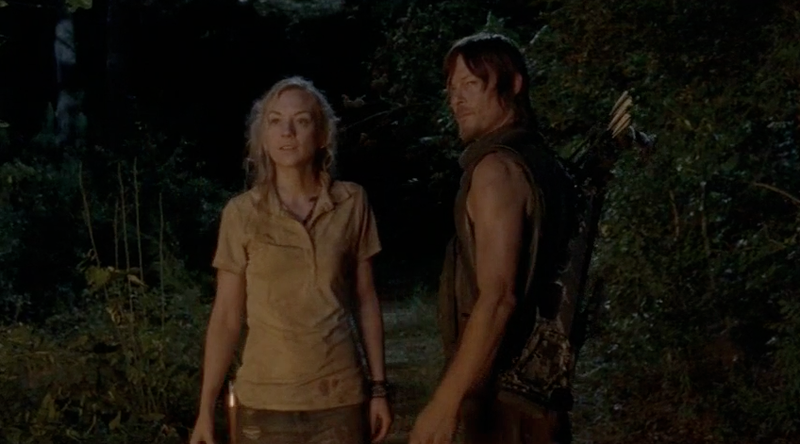 They debate whether to continue on to the sanctuary called "Terminus" or to stay in the grove. 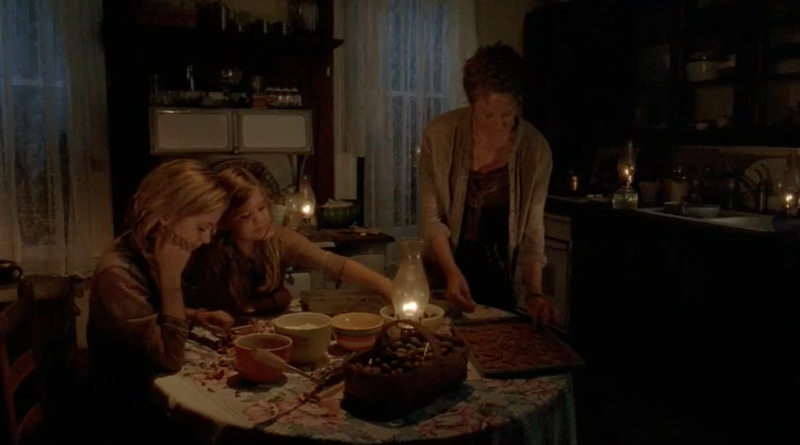 Over the next few days, Carol makes Cinnamon Pecans with the girls while Tyreese slowly recovers from his injuries. 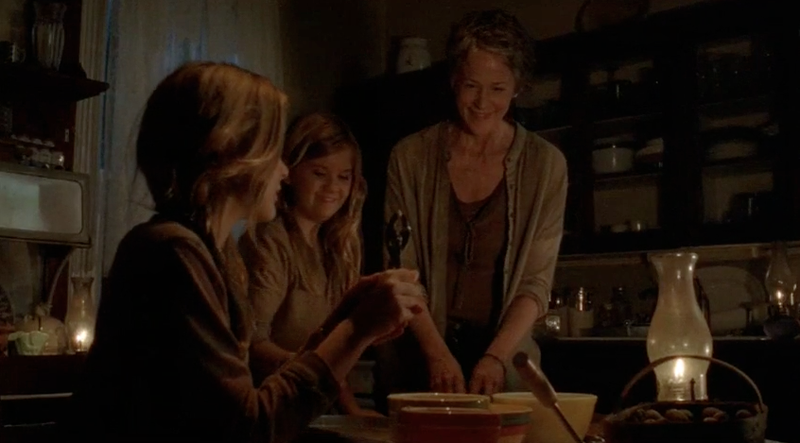 She tells the girls that her grandmother used to make the sweet treats with her when she was just a girl herself. 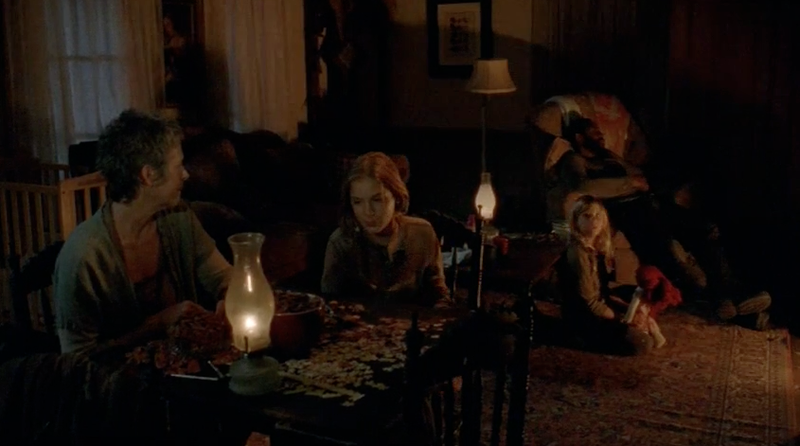 Neither Tyreese, nor Carol could have possibly predicted the horrors to come. At that moment, they were safe and happy as they filled up on pecans and peaches. 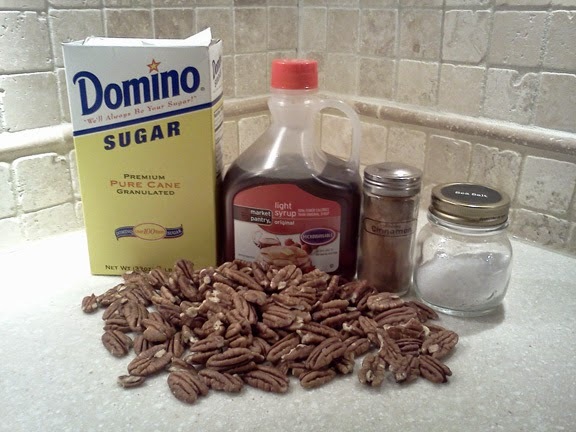 Cinnamon pecans are incredibly easy to prepare and only use five ingredients. They can be pan roasted or baked in a traditional oven. Enjoy them with your group and be reminded to savor the sweet moments whenever you can. And when the dead rise: and all seems lost…look at the flowers. Preheat oven to 350° or heat campfire coals until red hot and allow to cover with white ash. 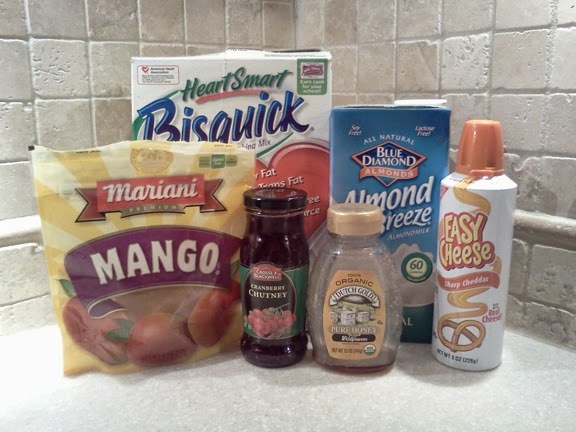 In a large bowl, combine the sugar, cinnamon, maple syrup and salt and stir until blended. Add pecans and stir gently until the pecans are coated with the sugar mixture. Pour onto a baking sheet and bake in preheated oven for 25 to 30 minutes, stirring half-way through the baking time. 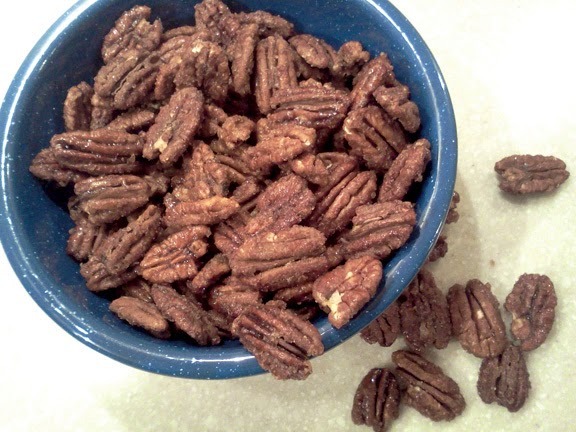 Pecans are done when they appear dry and the mixture sticks to the flesh of the pecans. Allow to cool and serve. Alternately, pour the pecan mixture into a cast iron skillet and cook and stir over medium-hot campfire until the pecans appear dry. Allow to cook and serve. 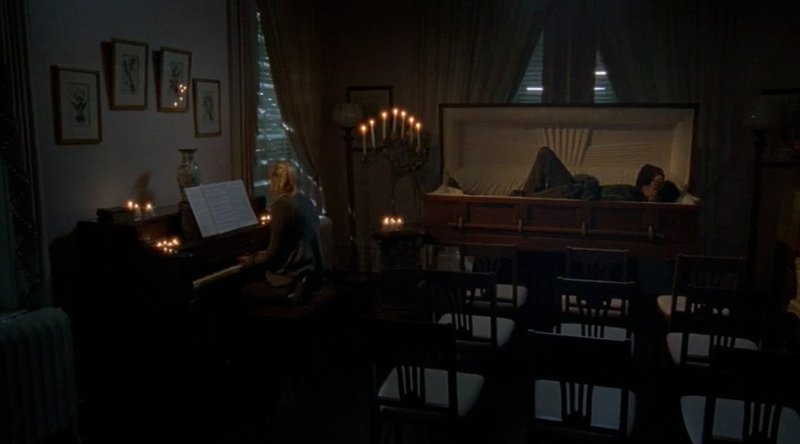 Daryl Dixon and Beth Greene stumble onto a small cemetery and a funeral home. Upon entering, they are immediately struck by the tidiness of the little parlor. They are startled to discover that in addition to the meticulously maintained property, the absent caretaker has also been busy preparing and burying Walker bodies. 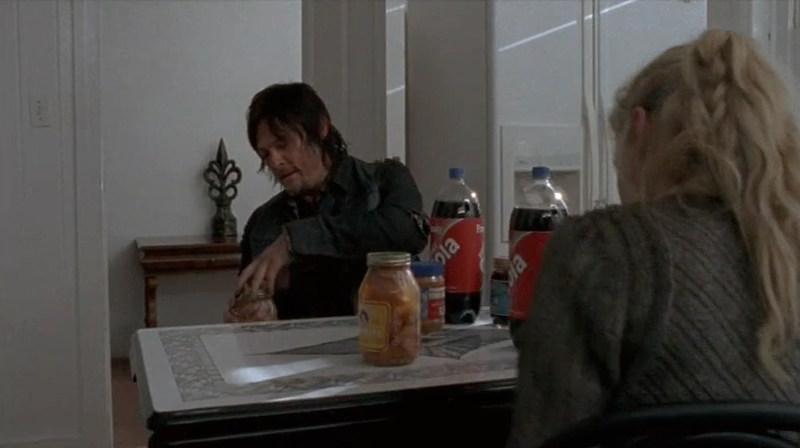 Once in the tiny kitchenette, Daryl and Beth find a small stash of food in the cupboards; including peanut butter, jelly, diet soda and pigs feet. 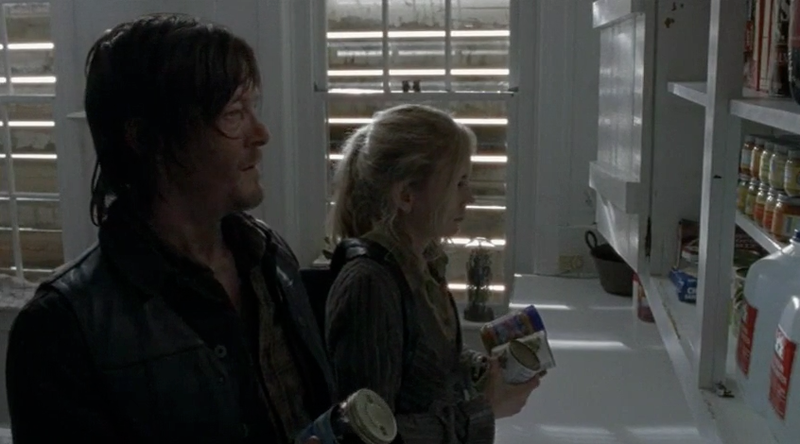 Daryl refers to the odd pantry combination as a "white trash brunch" and informs Beth that the pigs feet belong to him. He decides that they will only take some of the stash until they can find the "nut" who lives there. Beth reminds him that there are still good people left in the world and that he is counted among them for being unwilling to take all the food. 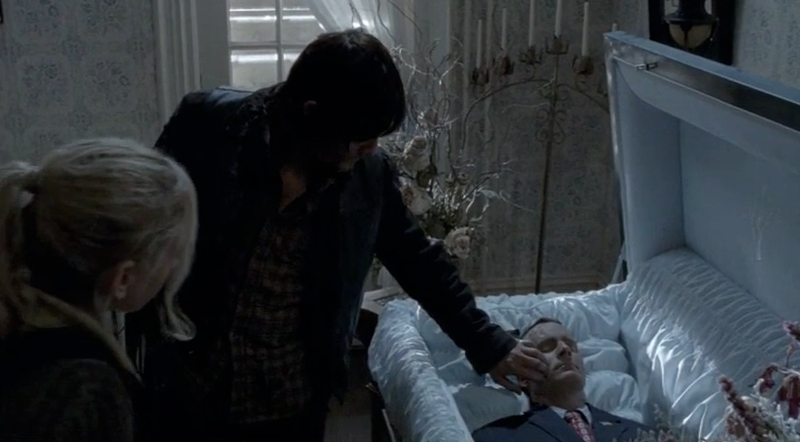 Daryl rests in an empty casket and declares it to be the most "comfy" bed he's slept in during the past year. Although they've struggled since the fall of the prison, at least that night the unlikely friends had a secure place to sleep and a full stomach. 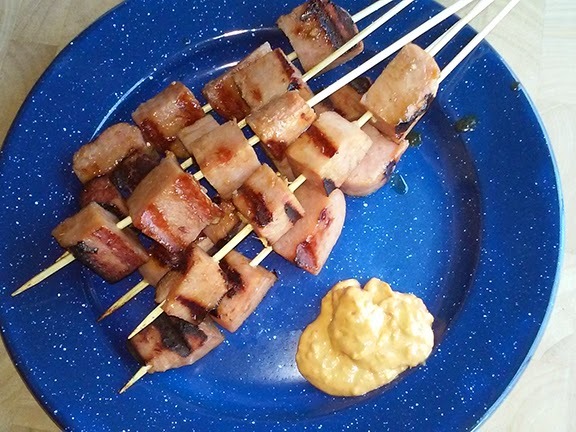 While the idea of pork and peanut butter may sound repulsive, a Thai-inspired Satay dish can be created with everything that Beth and Daryl found that afternoon. Living with meager supplies no doubt, turned both of them into experts at combining food. 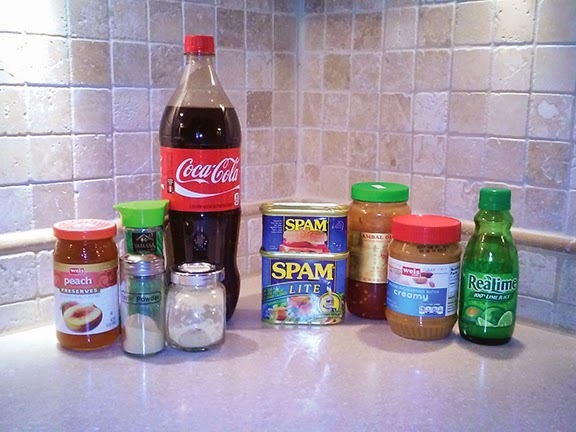 Soda, jelly, and some common pantry seasonings combine into a delicious marinade for the pigs feet. While we have substituted the more commonly found SPAM, you may feel free to use pigs feet if you can find them. Marinate for 30 minutes, thread on skewers (or sticks), and grill to perfection over your campfire. Peanut butter forms the base of a spicy and pleasing Thai Peanut Sauce to serve as an accompaniment to the Satay. And when the dead rise; and you hear scratching at the door…use the peephole. Always use the peephole. In a small bowl, mix all the marinade ingredients until well blended. Add the cubed SPAM and allow to sit for 30 minutes. Thread cubes of SPAM onto skewers (any kind you can find) and grill for 5 minutes, turning often. While the SPAM is grilling, mix all the Thai Peanut Sauce ingredients in a small bowl. Taste for seasonings and add more Sambal Oelek if needed. Remove SPAM Satay skewers onto a plate and serve with Thai Peanut Sauce. 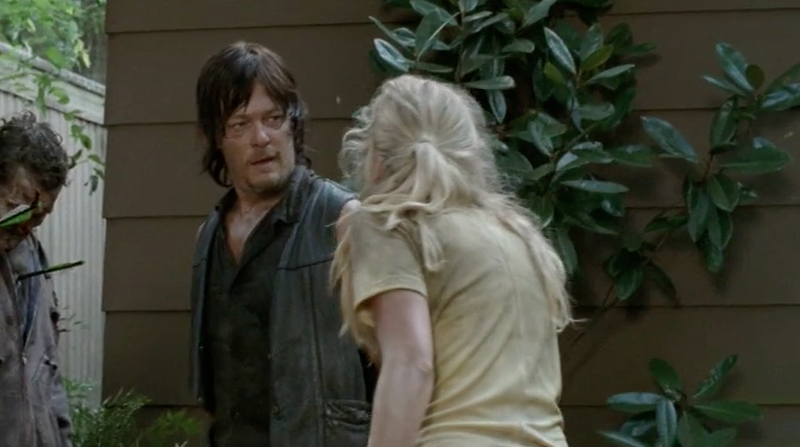 Daryl Dixon and Beth Greene have escaped the prison together. A massive herd forces the unlikely pair to take shelter in the trunk of an abandoned car during a thunderstorm. The next morning, they set up a tiny camp and Daryl goes hunting alone. Tracking a squirrel, he takes aim with his crossbow. The squirrel evades him and he realizes with a sinking heart that he has broken one of his six remaining arrows. Unwilling to risk any more of his dwindling supply, Daryl is successful in killing a rattlesnake for them to share. As they hungrily eat the meat, Beth decides she wants to have a "real drink" since she has never tasted alcohol. Daryl seems to not know how to respond, so he agrees. They make their way to a fancy golf club bar and Beth tries to sample peach schnapps. 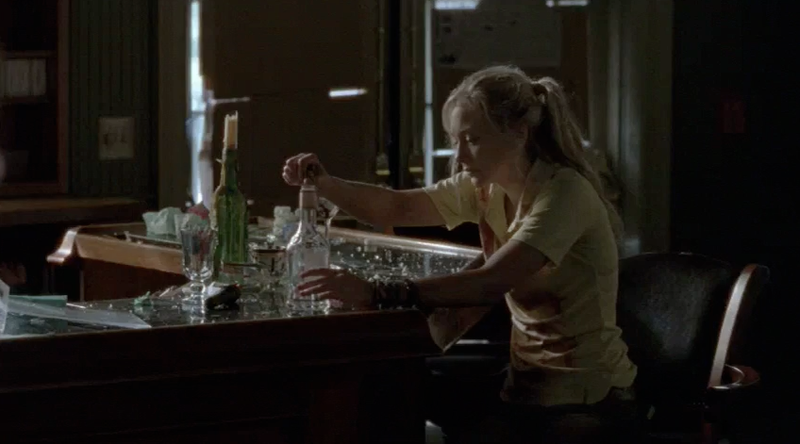 Daryl is disgusted by the idea of peach schnapps so he breaks the bottle and tells her that her first drink will be a real one. After finding a moonshine cabin and playing a drinking game; Daryl reveals that he did not have a job before the world ended. The only thing he had done with his life was follow his brother Merle around. 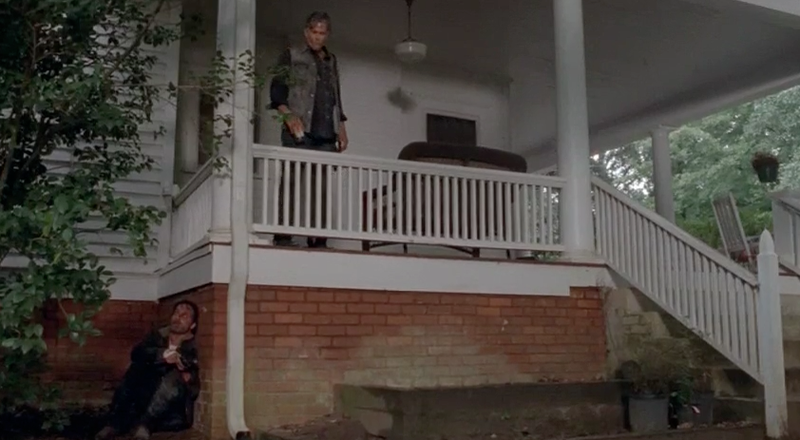 Beth assures him that he was meant to survive and that he will be the last man standing. She decides that she wants to burn the cabin down. 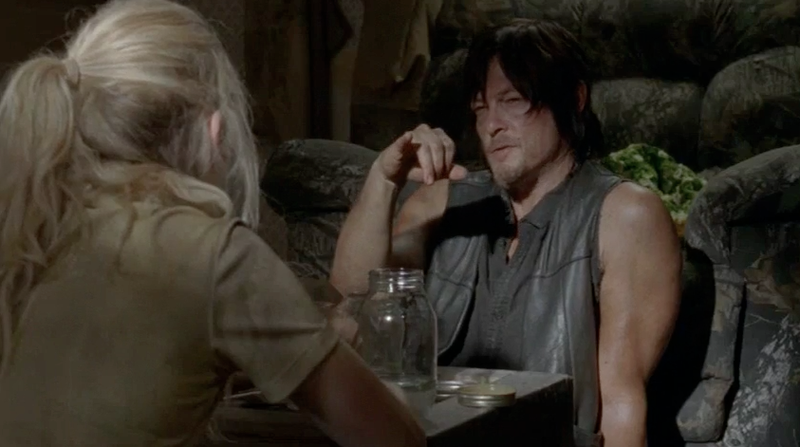 Daryl agrees again to her request and the two use the remaining moonshine as fuel to destroy the terrible little building. It has been a bizarre night but both are still alive and have a better understanding of each other. 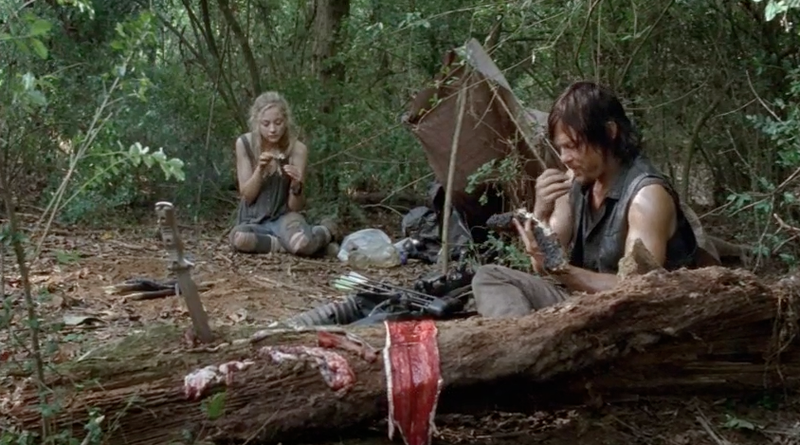 Daryl would have insisted that they set aside some of the rattlesnake meat and dry it into jerky. While rummaging around for liquor, they no doubt would have found a least a few canned goods and seasonings. 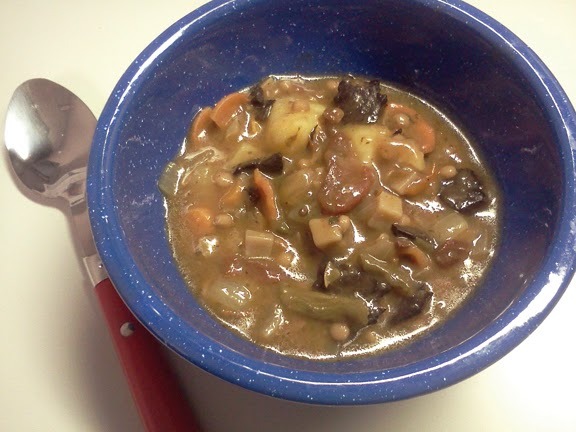 Rattlesnake stew would be a perfect way to use up the dried meat. Simmered with red wine (or a little moonshine if you have it), sun dried tomatoes and dried soup mix, any jerky becomes almost gourmet. Use rattlesnake meat if you have it. 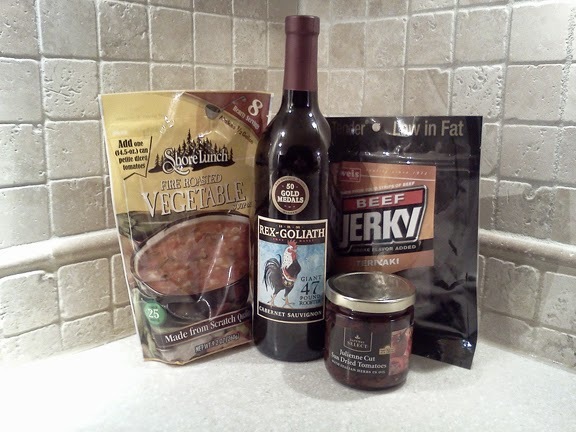 And for those of us that are not as skilled as Daryl Dixon, substitute regular beef jerky. 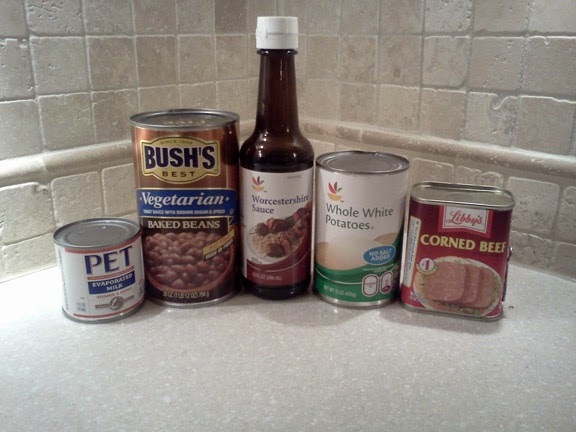 Optional canned vegetables will make it taste even better. And when the dead rise; you gotta stay who you are…not who you were. Over red-hot campfire coals, bring 1 cup of moonshine or wine and 2 cups of water to a boil in a large heavy stock pot or Dutch oven. Add beef jerky (or rattlesnake meat) and sun dried tomatoes. Allow to simmer for 20-25 minutes for the jerky version (or until softened) and ten minutes for the rattlesnake version. Stir in the remaining water called for on the package directions of the soup mix (Shore Lunch calls for 7 cups of liquid total so you'll need to add four more cups of water). Add optional ingredients if desired. Return to a boil and stir in soup mix. Stir well, lower heat (or partially remove from coals) and allow to simmer for 20 minutes, stirring frequently. 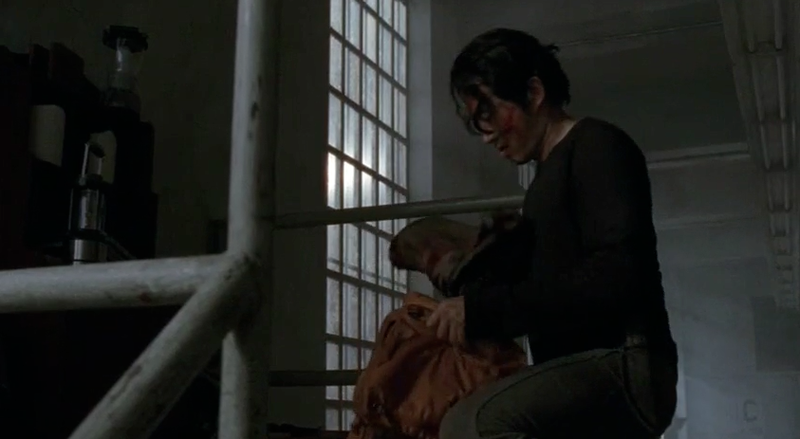 Glenn Rhee awakens to find himself on the destroyed catwalk of the prison's cell block. He is horrified to discover that he is entirely alone; save for a mega-herd of Walkers now swarming the prison. 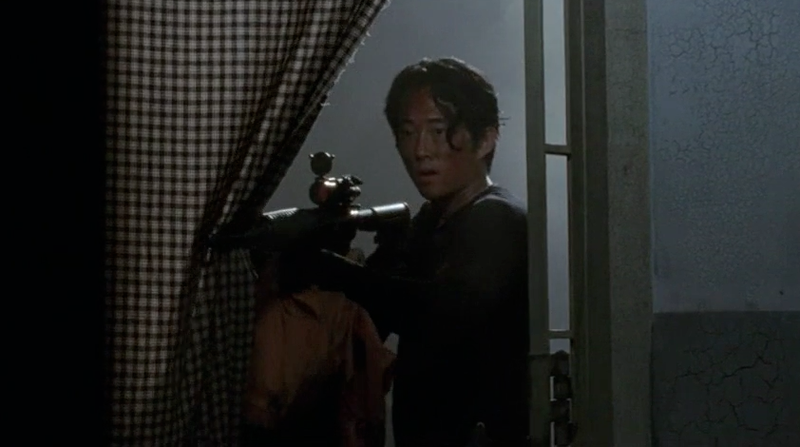 Uncertain as to what has transpired, Glenn quickly rallies and returns to the abandoned cell block to gather supplies. 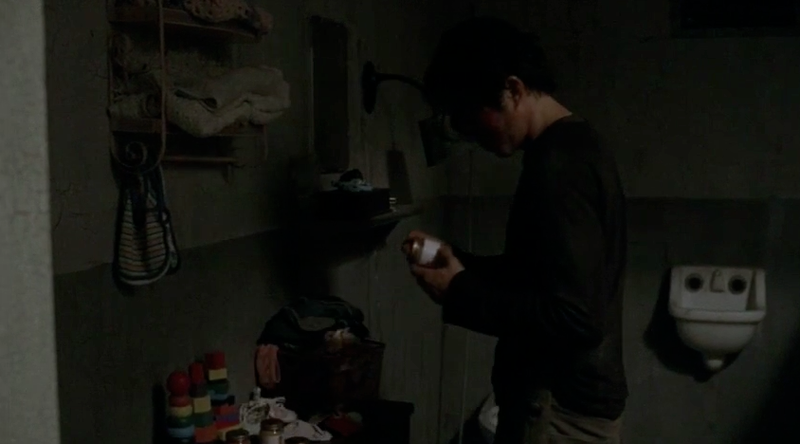 The ever-resourceful and optimistic Mr. Rhee takes a buck-knife, granola bars, food for baby Judith, canned goods and Daryl Dixon's poncho. Bolting from the prison, he finds the nearly catatonic Tara Chambers. She quickly confesses that she is partly responsible for the destruction; having been deceived by Phillip Blake into attacking the prison with the rest of the raiders. Glenn's kind-hearted nature wins out over his doubts and he tells Tara that he needs her to help him escape the prison and find Maggie. Seizing the opportunity to redeem herself, Tara agrees and the two battle their way out of the prison yard. Once on the open road, they cross paths with Abraham Ford, an Army-man-on-a-mission to deliver Dr. Eugene Porter to Washington D.C. Eugene is a scientist with information vital to fighting the viral epidemic now facing mankind. 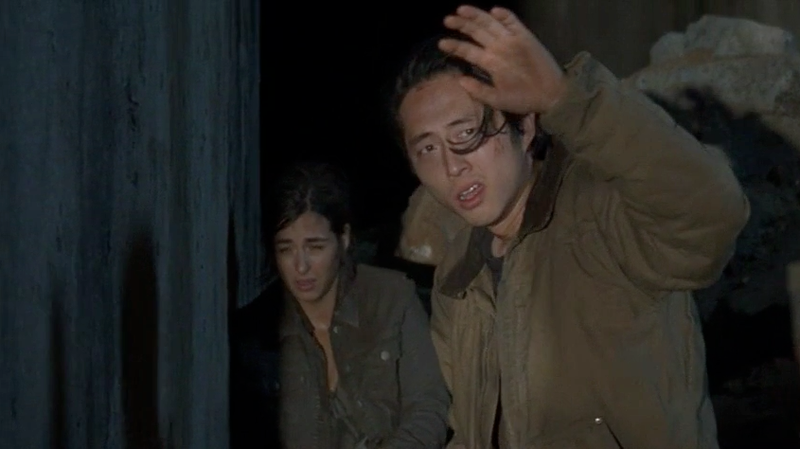 Still recovering from the effects of the flu, Glenn promptly faints, leaving Tara to decide their next move. Knowing that they are doomed if they remain on the open road, Tara agrees to accompany them. Abraham no doubt allowed them to take a break for food before they started on the long journey to the capitol. He would have had military rations and canned goods and likely instructed Eugene to prepare a meal after a fire had been started. With not much time to spare, the awkward scientist would have grabbed a few staples from their supplies and prepared Open Road Hash for them. With complete proteins, and complex-carbohydrates, Open Road Hash is nutritious, quick to prepare, and delicious. And when the dead rise; you find some strong, like-minded comrades and you stay stuck together like wet on water. In a small bowl, mash the (very well drained) canned potatoes with the back of a fork. Add evaporated milk (a few tablespoonfuls at at time) and mash again. Add salt and pepper to taste and continue mashing until they are the desired consistency (like mashed potatoes). 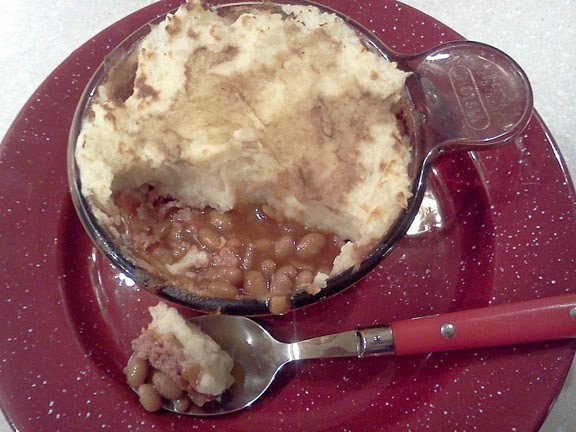 In the bottom of a small cast iron skillet, pyrex dish or other heavy small saucepan, pour the baked beans. Spread evenly and then layer on the slices of corned beef until the beans are covered. Then spread over the mashed potato mixture evenly over the corned beef. Sprinkle the Worcestershire sauce over the potatoes and spread out evenly with the back of a knife (or a pastry brush if you have one). Place cast iron skillet with the Open Road Hash mixture over campfire coals. Allow to heat over the fire until the entire mixture is very hot and the mashed potatoes begin to dry out on top and brown lightly.